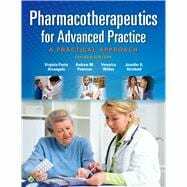 by Arcangelo, Virginia Poole; Peterson, Andrew M.; Wilbur, Veronica; Reinhold, Jennifer A.
Virginia Poole Arcangelo, PhD is a retired Family Nurse Practitioner who has taught and practiced at Thomas Jefferson University, and in private practices. Andrew M. Peterson, PharmD, PhD, FCPP, has worked in the pharmaceutical field for more than 25 years. He is John Wyeth Dean Professor of Clinical Pharmacy and Professor of Health Policy at University of the Sciences in Philadelphia. Veronica Wilber, PhD, APRN-FNP, CNE, FAANP, is an Assistant Professor in the Graduate Nursing program at West Chester University in West Chester, Pennsylvania. Jennifer A. Reinhold, BA PharmD, BCPS, BCPP, is an Associate Professor of Clinical Pharmacy at the Philadelphia College of Clinical Pharmacy at the University of the Sciences in Philadelphia.